We tried to record at least one blues tune for each bass. Here Steve lays down a great tune, called Blueswalk. (Chris Champion, guitar) While Steve actually plays on a Wan-Bernadel bass himself, this particular bass was one of a few that he chose from the day before the video recording. Thanks Steve! The tune, My Romance, is one of my all time favorite Jazz tunes and was specially requested. (Thank you Mr. Laspina and Mr. Champion!) I fell in love with this tune when would listen to the old, Bill Evans Trio (with Scott Lafaro), but whenever I hear another rendition of My Romance, I love it! Falling Grace was written by bass player, Steve Swallow. It's a beautiful, spiritual tune, that has a lovely latin feel to it. Off the Cuff, is a tune that Steve composed and it's very loose structure opens the door for his own (on the spot) version of improvisational direction. We were supposed to only 'take one', but the more we listened to the two different takes, the more we hated to not share them both. (See Take 1!) Which you do you like the best?! I am the lucky one that gets to hear and listen to Mr. Mike Kazepides play the bass almost daily. I sit right next to him in the Phoenix Symphony. (I know, I talk, way too much!) Here Mike plays the Bourees I and II, from the Bach Cello Suite (originally in C Major, but for bass players, this one is usually done in G Major). This is an often called for audition piece for most major orchestras. Mike shows how it is done! That's me, (the bald one) and I chose to play the Eccles Sonata, 1st movement in G minor. It is probably one of the best known classical bass solos that was made famous in the 1970's by bass soloist, Gary Karr. Through the years there has been many recordings and this is a solo that most students can't wait to start. Besides the Gary Karr recording, another really great one is with Edgar Meyer and Bela Fleck on the Banjo. It works! Henry Eccles, lived between 1670-1742 and is firmly planted within the Baroque music era. 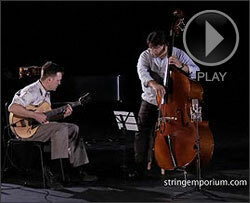 Dwight plays another great standard (SMPWC) and really shows off our Rogeri...again! Thompson Hybrid (RM-200), Warren Jones, ''Softly As A Morning Sunrise"
Warren plays another great jazz standard 'Softly As A Morning Sunrise' with Chris Champion on guitar. This shows off the balance and tone spectrum of our Thompson Hybrid Bass. A nice "solid" sounding bass. Barry Olson, is a colleague, dear friend and after almost 40 years, recently retired as principal double bassist of the Phoenix Symphony Orchestra. Barry is teaching in the Mesa Public Schools now and dedicates this excerpt of the Capuzzi Concerto for his students and all the young classical students studying this piece. This is another tune that Niels Henning played a lot with guitar players. 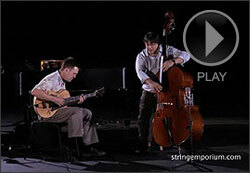 Warren and Jones, again remind us how well this tunes works with upright bass and guitar. Just calling or referring to Joe Fick as another Rockabilly upright bass player... just won't cut it. Joe IS Superman! Joe plays with a band in Memphis called the Dempseys and has more chops on the slap, rockabilly style than any another player on the planet. 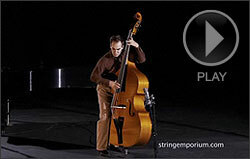 Steel strings, for Joe, are Kryptonite! Joe uses natural gut strings (a wound, gut E), with gut A, D and G. No cats were killed for this Video. Thompson Plywood Blonde (RM-100), Joe Fick (Rockabilly-Superman) Take 2! Here is another one by Joe. Similar, but just different enough to want to check out! See more Thompson Plywoods basses. Me again, this time I chose my Vincenzo Corain Italian bass (c. 1848) and my rare, Percivial Wilfred Bryant bow. (PW Bryant). I must admit: I am spoiled! Bryant bows, are much sought after French style bows. A PW Bryant bow usually fetches between $4-7k. This one I think matches by Italian quite well, but when I play the Finale, look out! I keep it simple: I play the opening passage from Beethoven's Recitative (from his 9th symphony) on my Bryant and then the same passage on my new Finale. (Both bows have equally new hair on them). It there is no real big difference, (other than the fact that the Finale bows cost only $340). In the 2nd comparison, I play a G major, 2 octave scale. Here one can also hear how the Finale Bow really 'draws out' the sound on my bass. Sorry, the Bass is not for sale! 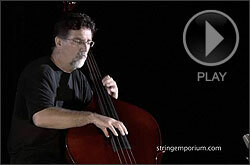 Jan Simiz is the perfect player to show off the tonal spectrum and personality of the Emile Gillet Cellos. Like Jan, these cellos are larger than life! Beautifully hand crafted in the centuries old traditions of instrument making, with a professional quality at an affordable price. What better way to show off the expressive and musical qualities of a cello, than with The Swan! 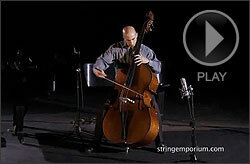 This work is by far, one of the most popular and well known solos played on the cello. It is beautiful and shows off our Thompson Cellos. The Thompsons are well made, beautiful cellos and sound...incredible.